McBASTARD'S MAUSOLEUM: Mad Foxes (1981) the most delirious and offensive biker action trash flick ever unleashed arrives on DVD from Full Moon! Mad Foxes (1981) the most delirious and offensive biker action trash flick ever unleashed arrives on DVD from Full Moon! 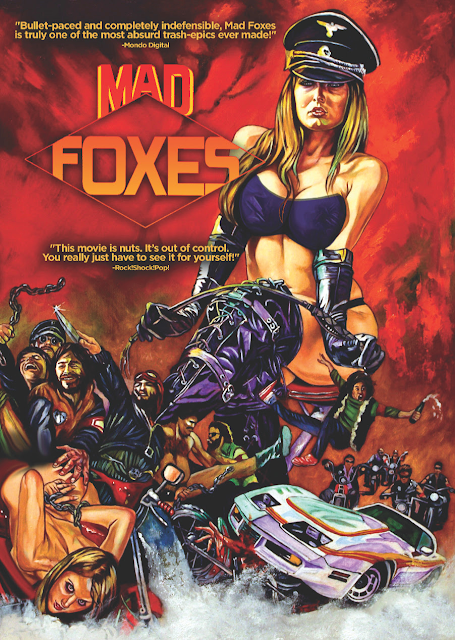 From Swiss exploitation producer Erwin C. Dietrich (Rolls Royce Baby, Jess Franco's Jack the Ripper, Barbed Wire Dolls) comes Mad Foxes the most delirious and offensive biker action trash flick ever unleashed! Mad Foxes is the drooling, spitting, screamingly offensive exploitation film you've been waiting for and is presented in a totally uncut, digitally remastered transfer culled from Dietrich's own negative. Rev them motors and dig in!